Back in November, some of us WIC staff members found ourselves listening intently to a room full of Japanese speakers in Goldstein Electronic Classroom for an entire day. No, we weren’t there to learn beginning Japanese. Rather, we were teaching students in JPAN 011 how to use voice-over PowerPoint to present themselves and their interests in a new final video project for the class. Although we’ve assisted many other classes with video projects, this was the first large-scale language class we’ve supported working solely with voice-over in PowerPoint. It was a great success for all involved! 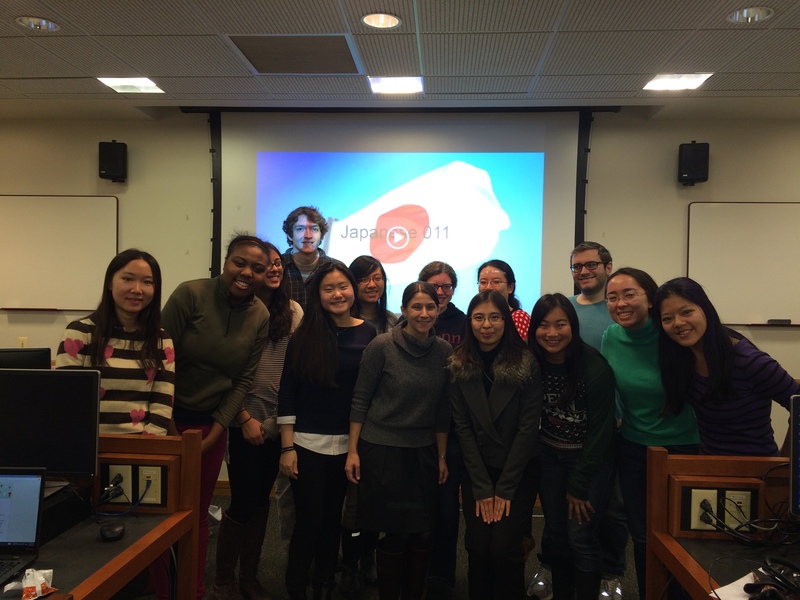 The whole process began in fall 2013, when Suyu Kuo, the course coordinator for JPAN 011, took a voice-over PowerPoint WICshop to improve her skills for using technology in the classroom. This academic year, she received a grant to develop a new multimedia project, called “Japanese Self-Introduction Video Clip thru Voice-Over PowerPoint,” and called upon WIC to help develop the assignment and teach both the course instructors and students how to do voice-over PowerPoint. After teaching Suyu and the other faculty members, Sachie Koizumi and Kenji Endo, how to do voice-over in October, we discussed the assignment parameters: how long each video should be, what should be included in the videos, and where students could upload and view each others’ work easily while keeping their work private. WIC created a Google Doc tutorial explaining the voice-over process and uploading videos to each class section’s Canvas discussion board. In mid-November, we met with each class section for a total of 50 students. For the first part of class, we taught students how to make a voice-over PowerPoint and let them practice with sample slides. The instructors had prepared an excellent example presentation in Japanese to model what a successful end project should look like; students practiced on this sample, using a well-developed script in Japanese. They were then ready to get working on their projects, with both WIC staff and their instructor there to help. At the end of the semester, students uploaded their final projects to a Canvas discussion board for their section and were able to view and comment on their classmates’ projects. Students also completed a Google Form survey with questions including: how they liked this assignment, how the technology did or did not improve their language skills, and whether they had known how to do voice-over before this class, among other questions. Many students enjoyed the assignment and thought it was a good way to enhance their speaking and listening skills, while also learning a new feature of PowerPoint that many had not known about before this class. We even got to view an exemplary student video, which we’re hoping to add to our Student Work Showcase. This experience with voice-over PowerPoint provided a valuable opportunity for both faculty and students to engage with technology for language learning. In Suyu’s words, “This video project allows students to compose their messages in a creative way through ‘multimodal’ communication that includes the textual, aural, and visual resources.” Working with the JPAN 011 faculty and students also provided an excellent example of how WIC fits into library course support from beginning to end. Here at WIC, we’re seeing more and more video projects crop up in language classes and are excited that we’re building a bank of projects and ideas in this area for all faculty and students to share. If you have an idea for a project involving new media and need a sounding board, we are always happy to help! Feel free to fill out a training request or get in touch with us at wic1@pobox.upenn.edu and we would be eager to work with your class. Thanks to the JPAN 011 faculty and students for a great fall semester project!